In the first installment of the new point-and-click dark fantasy adventure from Hyptosis, Kingdom of Liars 1, your career as the newest member of the Hernessian Guard doesn't exactly begin with the best of omens. Then again, you are now living in what they call The City of Rats, so you probably weren't expecting a cakewalk to begin with. 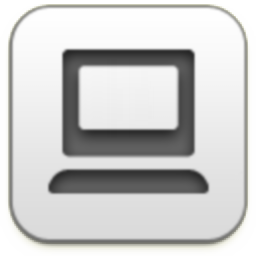 Click to interact, and pay attention to the way your cursor changes to denote people to speak to, items of interest, or objects to pick up. Once something is in your inventory, just click to select it, and then again wherever you want to use it. 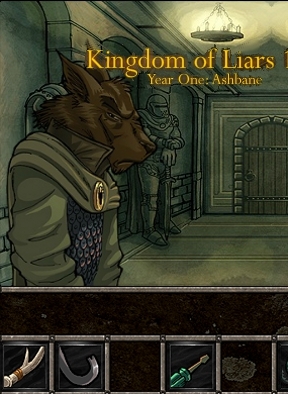 Kingdom of Liars is a short but fascinating little game that really showcases how far Hyptosis has come in his work. The way descriptions pop up when you mouse over items and the cursor changes over certain areas eliminates a lot of random clicking, letting you just scan around to take in all the little textual details. The artwork is pretty darned gorgeous, with imaginative, eerie designs, and since it this game exists in the same world as some of Hyptosis' other titles, fans will welcome the chance to explore a bit more. The downside? The game is so linear it's easy, with the last and really only puzzle perhaps posing a bit of confusion due to some awkward wording. Kingdom of Liars is full of creative ideas and boasts a much tidier user interface than we've seen from the developer before, and though it might be over before you're done with your coffee break, represents the start of an intriguing new mystery. Kingdom of Liars 1 Walkthrough now available! Click your sister to speak with her. Click the wooden drawer under the window to find a SCREWDRIVER. Use the SCREWDRIVER to force open the lock on the door and continue forward into the Train Car. Inspect the dead men, then pull the lever on the wall to turn on the emergency break. You will be automatically transported to Your Home. Click your sister to talk to her again. Move left to enter the Gray Elk Library of the Hernessian Headquarters. Speak with Captain Whelek to receive instructions to investigate the tavern at Grime Street. Go back once to reach the center of the headquarters, then move towards the lower right corner to enter the Training Barracks. Take the HANDCUFFS hanging on the right side of the wall. Pick up the ENCHANTED ELK HORN on top of the barrel. Leave the Hernessian Headquarters to view the town map, then travel to Right Street. Pick up the PRYBAR leaning against the urns beside the ramp. Leave Right Street to view the town map, then travel to Grimes Street. Take the SHOVEL leaning against the door of the right building. Continue right to the Burned Tavern Exterior. Talk to all of the witnesses and Wilcock to learn about the crime. Continue forward to enter the Burned Tavern. Click the bar counter to zoom in. Take the COIN next to the two glass cups. Inspect the corner of the burned note to read a piece of the message. Click the large crate to take a closer look. Use the PRYBAR to open the lid of the crate. Inspect the mold inside the crate, then go back out to the Burned Tavern Exterior. Speak with Tommy Wilcock again to receive orders to visit the captain. Leave Grime Street to return to the town map view, then travel to the Gray Elk Library in the Hernessian Headquarters. Talk to the captain again to report your findings and receive a new location on your map. Leave the Hernessian Headquarters to view the town map, then travel to Borynn the Alchemist's Shop. Speak with Borynn to learn about the mold and to receive instructions to visit Shribryn. Take the SHEARS beside the crate on top of the table. Leave Borynn's shop to view the town map, then travel to Grimes Street again. Speak with Shribryn to gain a new location on your map. Leave Grimes Street to view the town map, then travel to the Quiet Warehouse With A Blue Door. Pick up the KEY on the ground between the dead guards. Use the SCREWDRIVER to remove the metal plates at the sides of the locked door. Wedge the SHOVEL in the contacts on the right side of the spike trap. Put the COIN between the spinning gears to jam them. Use the SHEARS to cut through the section of the wire that's just above the top of the padlock. Place the PRYBAR under the door. Open the padlock with the KEY. Go through the opened door into the Grow Lab. Speak with the filthling scientist to learn the truth about the recent crimes. Use the HANDCUFFS to arrest the scientist. 4 shrooms -- awesome graphics, very moody, mostly logical puzzles...but too short! Hope to see the rest of this one soon. The typos, they wound me. Exact same problem they had with the "Alice is dead" series. Great games, but way too damn short. Also, I assume the end of this trilogy will be a "cliff hanger" like Alice is Dead, so that deters me from even playing. The graphics are - as always with these people - just plain beautiful and very, very clever. The gameplay isn't hindered by silly controls. It's actually all very nice. But why does it have to be so utterly boring? I'm sorry, but I don't feel either thrilled or challenged by (for instance) "finding" a thing with a big arrow over it, only to "discover" later that the same thing somehow and unexplainably fits into the thingamajig you are supposed to tackle. Why not throw in a couple of real riddles instead, like in the olden days of adventure gaming? Just something to keep in mind, sadagar; there is no "these people" with this, Hood,or The Sagittarian. ;) All these adventure games are made by ONE guy, who worked on the Alice is Dead series with someone else. He has been experimenting with and learning to create these games on his own. Thanks, Dora - I didn't know and stand corrected. The Alice series for one is just marvellous and I really do admire his/her dark, haunting and truly imaginative mind. I apologize if my critical comments on this game seemed disrespectful. Stunning yet again. Whoever's behind this should publish some sort of sourcebook in regard to these games' background as well - at least Hood and KoL clearly draw from the same well. It'd make great RPG material. I can't play this on jayisgames, I just get a white screen. I think it's something to do with the embedded medal system. It's playing fine for me on newgrounds. Anyway, absolutely beautiful, impressive game. Lovely art. Even more impressive if it's all done by the same person. It's all in the little details of the world. Yeah, the puzzles aren't up to much, but I didn't care. I hope future installments keeps the puzzles simple and concentrates on the interesting dialogue and descriptions. I'd like to see those ant-men again for instance (and their blue handler). I liked the nod to Pratchett (Grimes St) and it was nice to see an old character from the other games. Hey, does anyone recognize Warren as The hunters younger brother from Hood?